Aluminum Electrolytic Capacitors are produced in a very wide range of capacitance values, and they perform particularly well in the high-capacitance range by combining large capacity in relatively small packages. Aluminum Electrolytic Capacitors are offered in the common radial packages with solder or screw terminals and also in surface-mount packages. Aluminum Electrolytic Capacitors are well suited to be used in applications such as power supplies and audio amplifiers. 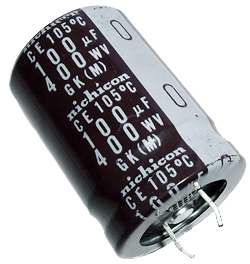 Manufacturers of Aluminum Electrolytic Capacitors include Kemet Corporation, Vishay Intertechnology, Panasonic, Epcos-TDK, Nichicon and United Chemi-Con. Procure International offers both current production and obsolete Aluminum Electrolytic Capacitors from most of the world’s manufacturers at very competitive prices and short lead times. Search for the Aluminum Electrolytic Capacitors you need using the Part Number Search bar at the top of this page, submit your RFQ to get pricing, and place your order directly online using our secure online ordering process.